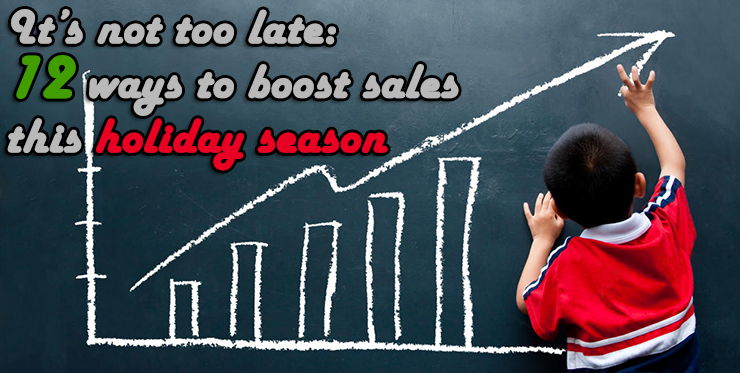 Businesses know that the holiday period can be critical to the success of their entire year, with nearly one fifth of annual sales occurring during these couple of weeks. And of course online sales are playing an increasingly prominent role in the hustle and bustle. There were $72.03bn in ecommerce sales during 2014’s holiday season and this year it’s expected to grow to $79.4bn. It’s clear that brands need to pay attention to the role their websites play in customer conversion. Although Thanksgiving has passed and the holiday rush is already upon us, it’s not too late to get your site ready for the influx and hopefully increase sales. Identifying keywords that can help direct traffic towards your website is an enormous benefit. Remember that organic search is still the primary driver of traffic. According to our research at BrightEdge, it is responsible for 51% of the visitors who land on your site. Examine your existing content to identify keywords that seem to be attracting the most traffic, particularly during past holiday seasons. You can also use available keyword research technology to identify keywords that are particularly popular this time of year. You should also go back to the basics with your original buyer personas. These personas should help you identify what your customers are most likely going to be looking for during this year-end period. Knowing what customers are interested in can help you identify important keywords. Finally, you also need to think local when developing your keyword list. This is particularly important if you have a brick-and-mortar store. Local keywords can help you reach the 52% of people who researchproducts online and then buy in-store. Take the keywords you have from each area and compile them into a list. Identify the words that you lack content for or only have poor-quality material. You can then use these keywords to create holiday-centric content and update existing material to use these words. This content should not only be formulated to rank well, it should also encourage customers to convert, for instance: compelling product descriptions. Remember that after you post a new page, it can still take several weeks before the Google spiders to crawl it so that it influences your ranking. Ranking in the first SERP for an important holiday term won’t do you any good in February, so make sure to handle this step soon to maximize your exposure. If you want the visitors you attract to your site to convert, you need to make sure that your landing pages have been fully optimized. First check and verify that your pages and your checkout process are streamlined and easy for customers to navigate. You will also need to consider user psychology for landing page best practices. For example, trust symbols that convey your reliability can be particularly valuable as customers get closer to finalizing their purchase. Inspiring, time-sensitive language can also motivate people to click ‘buy’. During the holiday season, a simple reminder to buy before a particular day to guarantee arrival by Christmas, for example, can be extremely useful. Remember also that it’s common for customers to want to contact you with simple questions during the check-out process. If they cannot find your contact information easily, they often just click away. Make sure that your phone number is readily available. A live chat box can also be an extremely valuable way to put customers in contact with brand representatives for quick and easy questions. Live chat boasts high satisfaction rates, with 73% sayingthey were happy with their experience. This contact option also increases the likelihood of people completing a purchase. Optimizing your page also requires regularly experimenting with language, colors and designs. Running A/B tests can help you determine that design that customers are responding to the most during the holiday season. Sometimes something as simple as a different color on your ‘buy’ button can result in an increase in conversions. Imagine that a potential customer is searching for information online about a product they want to get for their partner for Christmas. They see that you have what they are looking for and excitedly click over to your site, but you failed to update your page with extended holiday hours and you site says that you are closed. You just lost a sale. This type of occurrence can end up seriously hurting the bottom line. When preparing for the holidays, do not overlook the basics of updating the site to reflect the season. When you begin to review your site, also think about the concerns that your customers might have. If you sell products and services that are popular holiday gifts, then people are often going to be concerned about shipping. They know it is common for packages to get slowed down by the busy holiday season. If you can guarantee shipping by a particular date, do it to offer customers peace of mind. Put yourself in the position of your customers and think about what they are going to want to see. Mobile shopping is quickly rising, particularly during the holiday season. At BrightEdge, we found that by Q3 2014 the average order size was almost equal between smart devices and desktop. This indicates that people are not afraid to order goods and services of all sizes on their mobile devices. Mobile cannot be neglected if you want a successful holiday season. Of course, mobile purchases do not even account for those who might do research online and then head to a brick-and-mortar store to do the actual shopping. An estimated 81% of purchases begin with an online search. People use the internet to learn about everything from different options, customer reviews, prices and availability. You also need to be ready to cater to these customers and answer their needs. Make sure your site is mobile-ready by reviewing Google mobile best practices. Click and collect has also been a growing trend, when customers can reserve items online and pick them up in the store. Consider if your facility has the capacity to meet the demands of this type of service and implement it if possible to help customers streamline their shopping. Customers want to see consistency between online and in-store listings and experiences. For example,69% of customers polled said that they want to see consistent prices between what they see online and in the store. However, nearly a third say that they can find better prices online. This desire for consistency also includes promotions and item availability. You also cannot neglect to consider the importance of social media. Channels such as Instagram and Snapchat, make it easy for people to share pictures and ideas about gifts and other purchases. Consider ways you can encourage that behavior, such as posting appealing images of the product in use. Social networks in general can be enormous sources of inspiration and motivation for purchases. Techniques, such as using incentivized promotions and encouraging people to share their purchases with others, can help you use these networks to bring in even more customers. To bring it all together, here are the 12 ways to boost sales. The holiday season is upon us. Do not waste time and lose money by postponing the optimization process. The year promises to be even bigger in terms of online shopping, so make sure your site is ready pull in customers. When should you start your holiday marketing?